NTCL Recruitment are 40 posts. Candidate must have completed graduation in any stream from recognized university. Interested/ eligible candidates have to go through the NTCL official website www.ntcltd.org. Application submission last date through post is 30th October-2017. Application forms should be received through ordinary post only. Applicant should also send attested copies of all educational qualifications and experience certificates. Candidates should have maximum age limit of 35 years for Security Supervisors and 28 years for Clerical Staff. Pay scale for Clerical Staff Jobs is Rs. 4200/- to Rs. 4625/-, Pay scale for Security Supervisor Jobs is Rs. 11,600/- to Rs. 26,000/-. For more details of Application procedure, Selection process, Age limits, Educational Qualifications and other details of National Textile Corporation Limited NTCL Recruitment are given below. 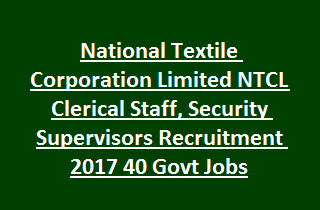 There are total 40 vacancies available in National Textile Corporation Limited NTCL Recruitment 2017. Total No of posts: 40. 1. Clerical Staff: 26 posts. 2. Security Supervisors: 14 posts. Candidate must have completed Graduation in any discipline from recognized University. Go through the NTCL notification for more qualification and experience related information. Clerical Staff: Maximum age is 28 years. Security Supervisor: Maximum age limit is 35 years. Age relaxations for SC/ ST category is 05 years & for OBC category is 03 years. Crucial date for age limit is 30-10-2017. Selection of candidates is based on following stages. Interested candidates have to go through the NTCL official website www.ntcltd.org./. Download the application form and fill the form according to the instructions. Send the original application form along with self- attested documents. Last date to receive applications through ordinary post is 30-10-2017 before 05.00 PM. 15 NM Marg Ballard Estate, Pin- 400001.